As flight engineer, I sat just beneath the flight deck’s overhead windows, Windows 7 and 8. At liftoff, I used my kneeboard mirror to look over my shoulder and down into the flame trench. I caught a shocking glimpse of the three main engines hurling tons of steam and water across the pad. Then a white-hot burst of light lit up the firebrick trench as the boosters ignited. I was only too happy to avert my gaze from the violence outside and get my eyes back on the CRTs on the instrument panel. 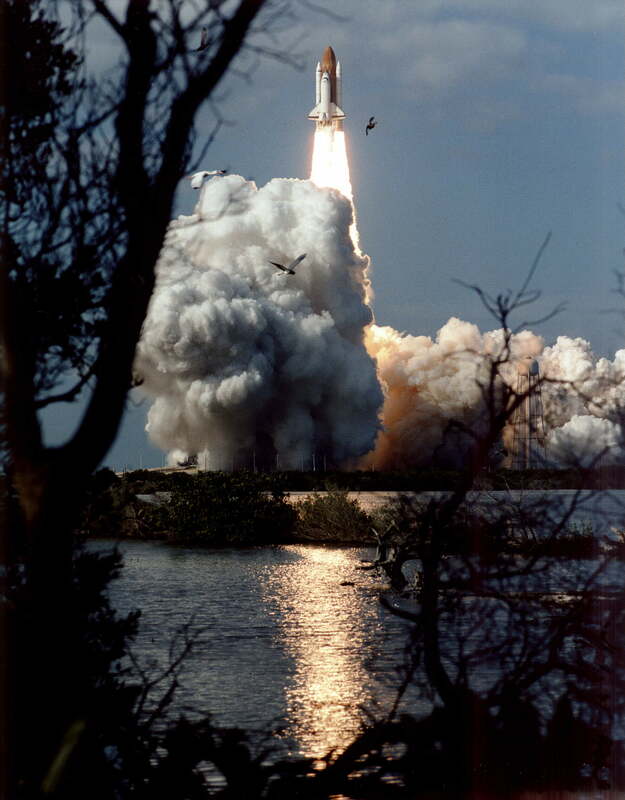 My job was to confirm, at liftoff, that the flight software had moded over to “Ops 102,” first stage. I confirmed that indication on the screen and called”102-102,” but I’m afraid it came out a bit garbled from the jolt of liftoff and the excitement of seeing our 4.5-million-pound ship leap from the mobile launch platform. We were committed! Columbia rides her SRBs and main engines about 90 seconds into flight. 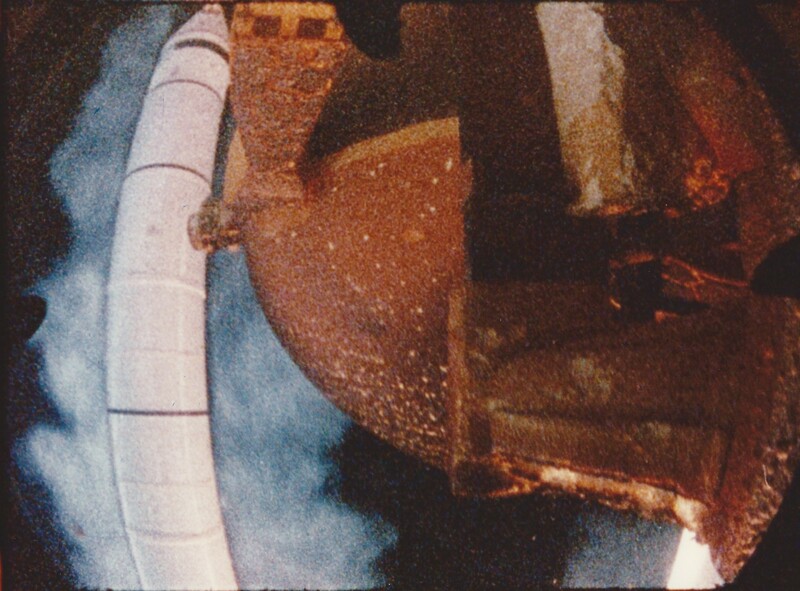 In the tracking camera shot above, note the flames recirculating about the base of the external tank. We were at about 2.5 g’s at this point, heading toward a booster burnout altitude of about 30 miles, at nearly 3000 mph. The mid-afternoon sun lights the orbiter as we head east into our 28.5-degree inclination orbit. 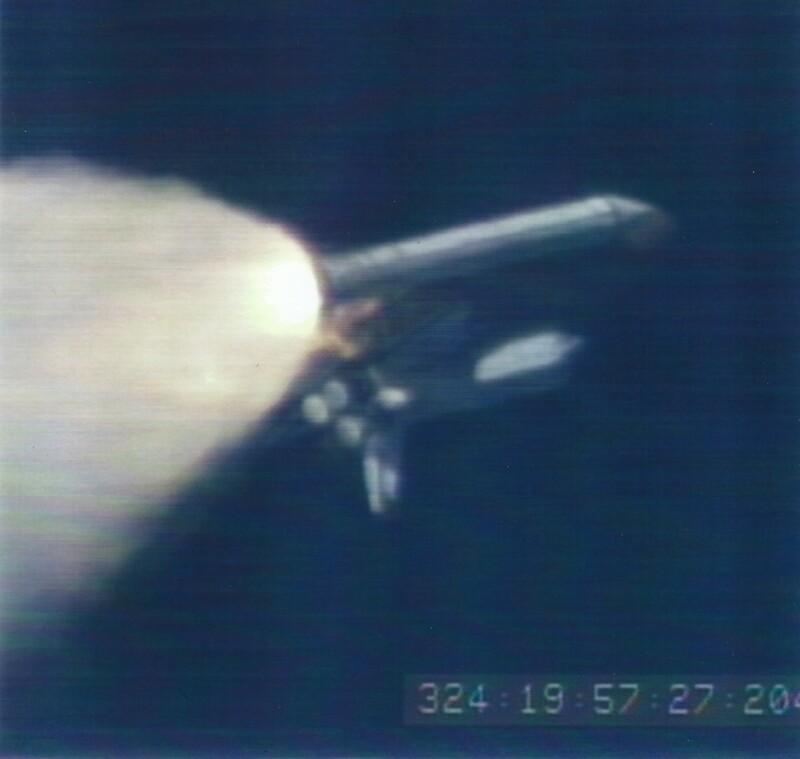 During Columbia’s launch, a 16mm film camera captured solid rocket booster separation and external tank separation. This frame shows the left SRB peeling up and away from the external tank amid a white plume of exhaust from the nose separation motors. Inside the flight deck, we had just seen a brilliant flash from the ignition of those same motors, and a loud “CRACK!” as explosive bolts severed the structural links between booster and tank. Our ride instantly became smoother as Columbia powered ahead on the thrust of its liquid-fueled, space shuttle main engines. Acceleration had dropped back to just over 1 g, 2 minutes into the flight.